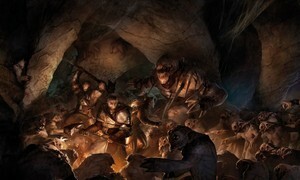 Claustrophobia 1643 from Monolith Editions is a miniatures-based survival game set within the catacombs of hell. This SoundSet is bundled FREE with the Syrinscape Board Game Player. Simply download and install the player here, and install the SoundSet. You won't even need to register an account! In essence dice are allocated after rolling to perform actions, while cards or special abilities are also available. The game is about managing decisions and choosing what to do with the resources that you have, managing difficult events and out-thinking your opponent. Combat is handled by dice. Complexity is low, with the focus on theme and building towards a tense, climactic ending. This SoundSet will appear by default in the Syrinscape Board Game Player app, but you can make it appear in any of the apps by using the Campaign Manager. Featuring the vocal talents of Philippe Tapimoke, Aurore Doublet, Charlotte Doublet & Barry Doublet. A big thank you to David, Erwan, Fred and the team at Monolith for opening the door.